Braised red cabbage is slowly cooked in white wine with a hint of ginger, making it the perfect accompaniment to winter dinners. What type of drunk are you? And by that, I don’t mean what type of alcoholic are you, I mean, what are you like after one sip too many? I want to go straight to sleep after I have had one too many sips of red wine. In fact, one night I bid goodnight to Dave and Alex and went upstairs and left them to chat. Dave is completely different from me and gets quite chatty. We have a few friends who get loud and fun and then we have a friend who gets violent when she has had too much to drink. A few weeks ago we were at a whisky vs wine evening and I had far too much to drink. Each of the 4 courses were accompanied by a generous tot of whisky and a decent glass of wine. Sadly for me, the tiredness kicked in, I don’t remember what the last whisky tasted like and I was asleep in the car quite soon after we left. It has made me quite resolved to never drink over my limit again and so far I am proud of achieving this. I usually don’t drink a lot in any case, but drinking less when socialising is not that easy to do. I have to convince those people around us that I am quite happy making one glass of wine last me and entire meal. Another thing that lasted quite long was this braised red cabbage. Part of my crate included one very large red cabbage and I decided to try something new and braise the cabbage. It loses its vibrant colour a bit but the taste is amazing and we enjoyed the cabbage with several meals. Red cabbage is slowly cooked in white wine with a hint of ginger, making it the perfect accompaniment to winter dinners. I like the hue of red cabbage. And though you mentioned it lost some of its vibrant colour in this dish, it still looks attractive! i guess my homemade chinese sausage gonna be lovely for this recipe too! Hi Tandy, this braised cabbage dish sounds wonderful. Wine always makes me sleepy. Sounds delicious, I have a red cabbage in the fridge and I will definitely try your recipe. Beautiful cabbage Tandy! Who doesn’t love that royal purple color in food? And everything else for that matter. Hope you’re enjoying yourself in France, how lovely. Delicious, the perfect fall recipe and with the ginger very warming. What a pretty cabbage! Could definitely dress any plate up. I love cocktail tasting and wine, but have a super low tolerance.. I just feel tired and sick if I drink too much. Ah, how I sometimes miss the younger days! I wonder if youth made it much easier? 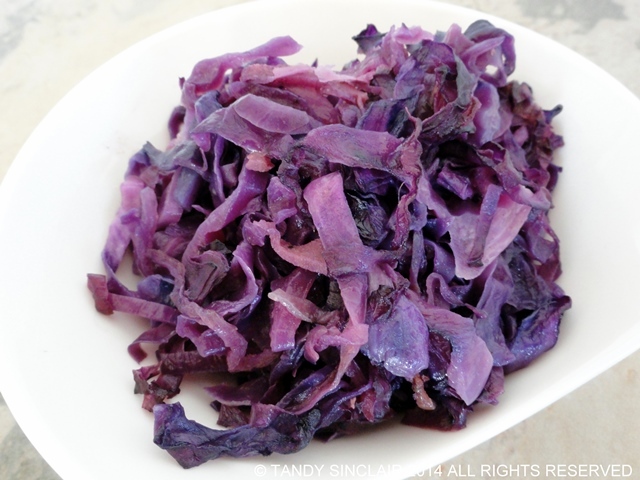 I love red cabbage and just made a dish with it recently that I will be posting soon – mine is very vibrant – Tandy – but it only a reasonably short cooking time. Love the addition of ginger here – must try it next time.